Okanagan WaterWise - One valley. One water. - Where does our water go? The Okanagan Basin Water Board undertook an important and enormous project to find out where our Okanagan water is being used. It compiled data for the whole valley and determined that the average person in the Okanagan uses 675 litres of water each day! This is more than twice as much water than the average Canadian uses, which is 329 litres per day. Clearly the Okanagan average is high and needs to be addressed, especially when we have less water available to us than almost anywhere in Canada. Interestingly, the average resident in France uses 150 litres per day and, in water-stressed Israel, people use 135 litres per day. The figure of 675 L/day is an annual average for all Okanagan residents. Our use in the summer is actually much higher than in the winter. Residents in the North Okanagan, where they receive more precipitation, use less water than South Okanagan residents who live in Canada's only pocket of desert. People in communities that use water meters and pay for the amount of water they use each month probably use less than those who aren't on water meter. Most Okanagan communities have installed, or are installing, residential water meters. Check yours to see how much water your household uses each day, each month, or each year! Most of the Okanagan's water is used for agriculture, but this is working water, producing food and other products that nourish our communities and support the economy. The Okanagan Valley is famous for its fruit and wines, and it takes a lot of water to keep the vineyards and orchards healthy and productive. The second biggest use of water in the Okanagan is residential outdoor use — in other words, people's yards and lawns! Lush green lawns use a tremendous amount of water, making them more suitable for wet cities like Vancouver and Seattle. There are lots of ways to have a beautiful yard that uses less water. Check out our Be WaterWise - In the yard page or visit Okanagan Xeriscape Association. We all share the same water in the same valley. We need to remember that how our communities use the valley and its water affects us all. 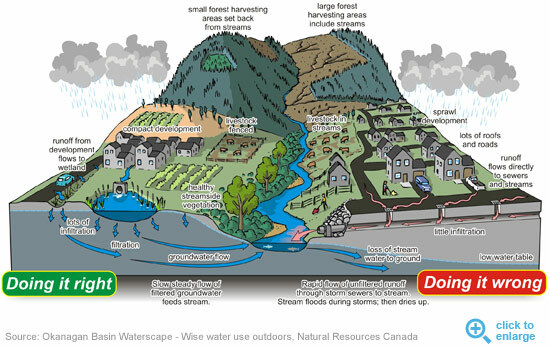 The diagram below shows some WaterWise ways we can care for our valley. How can you reduce your demand on our water supply? Check out our Be Waterwise sections for tips and links to great water saving ideas. View other key findings from the Okanagan Basin Water Board's Water Supply and Demand Project.